I was talking to a colleague about messaging the other day and he had a really good analogy that I wanted to share in thinking about how and what you communicate with your target market. He mentioned trying to be a “good doctor” when you are creating messaging and deciding on what to communicate. Here’s the concept. 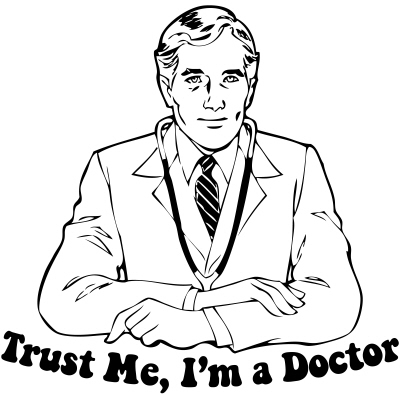 A good doctor won’t tell you all the degrees he or she has on their wall, what they studied in medical school or the latest medical research they published but they will focus on the individual patient and tailor their messaging accordingly. They will identify the problem (or more appropriately, the pain point) for the patient and will work to communicate the solution to their ailments, stressing why this solution is in the patient’s best interest. The key here is focusing on solving a particular problem for their customer (the patient), explaining what the problem is without getting into innate detail all while demonstrating the best solution for the patient. They aren’t just offering a pre-packaged solution off the rack but are really trying to customize one to the needs of their patrons. This makes a whole lot of sense when you think about your messaging from a marketing perspective. You need to identify the core pain point of the audience you are trying to attract, communicate why this problem needs to be solved and offer the best solution for helping to solve this problem. While this is important in marketing and sales, it’s just as important when you think about your Career Site and the messaging you use that drives your employer brand. Focus on the career: For candidates, the main problem that they are looking to solve is 1) they need a job (active candidates) or 2) they want a better job (passive candidates). In both cases and especially in the second, just having an open job position in their field isn’t all too compelling. It might be a great job but a single job description can only do so much to communicate that. What we really need to try and accomplish is to educate candidates on why your organization is a place to start and / or grow their career. This doesn’t mean going on about your company stats and history but moreso showing and communicating the successes of your employees. And being forthright with how you help candidates build skills and thrive in their careers. This is what you are trying to accomplish. Because if you accomplish this, then finding a job for an interested qualified candidate should be the easy part. Create tailored messaging: No matter your organization, you are looking to fill jobs in a variety of disciplines with candidates that have unique and diverse skill-sets. Most importantly, the candidate populations have different interests and key drivers in how they make career decisions. So how do you communicate in the best way possible to make sure your messaging is resonating with them? Career Site: Start to think about your Career Site not as a static place for your boilerplate and compliance approved messaging but as a group of interactive messaging paths for each candidate population you look to recruit. Each messaging path should have a optimal flow from the homepage to communicate the right targeted messaging and employee stories to each candidate population. For instance, an engineer should be able to go from generic employment messaging on the home page and drill down into information specifically designed for engineering talent with employee stories, custom content and benefits that fit this discipline. Best of all, this would provide a great tool for recruiters to point particular candidates towards to communicate the true value position for working at the company with their specific skill-set. Campaigning: Organizations will need the right tools such as Recruitment CRM to segment the different candidate populations they engage with and campaign to them with unique messaging that really resonates. In order to be successful, this messaging in email & SMS form needs to be targeted to the specific population with content that fits their interest and jobs that fit their skills. In this initiative, you are aiming to provide true value to the candidate, not playing the numbers game and spamming their inbox. Employees front and center: Just like any doctor, basing your messaging on prior experience with this particular problem can be the best way to communicate the solution. For organizations, this is showcasing their best recruitment tool, their employees. Whether it’s in written text, videos or other media, it’s important to highlight your employees and what they’ve achieved in your recruitment messaging. The more you can tailor it to the specific candidate audiences, the more it will resonate with the qualified candidates you are looking to attract. Your employer brand is all based on the perception that a candidate has of your organization and the career opportunities you offer. While candidate experience and other factors will affect this brand, your messaging can go a long way to helping candidates understand the true value of working for your organization and can help you better attract the qualified talent you need to drive your business forward.